After selling my Cobalt SS a while back I started missing boost. Z24 has been sitting since. I also came to a point of telling myself this is all a waste of money. But when I’m bored it helps to have a fun car lol. So I finally started working on the LD9. I’m going with a Felpro head gasket this time. Cometic is not convenient to have to retorque. Nice to see some LD9 love. Did you have a copper gasket before? No but I did use copper spray. It was a three layer gasket. I wonder if those dam rivets were the issue. 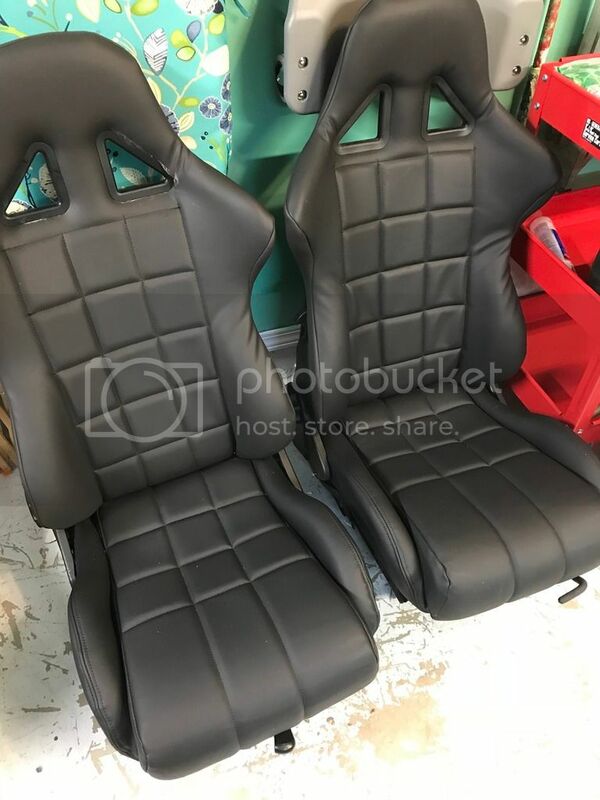 What seats are those, I'm finally getting back to finishing my 2000 Z24 as well and I have a similar engine build to your 2.3/2.4 hybrid with a turbo as well and I can't wait to get it running and drive it again. Are you going to use the turbo header and downpipe from before? What jason said. If you are interested I have a turbo setup for sale. Pm me for details if so. Cometic is not convenient to have to retorque. Who says you have to retorque? Mine's held up just fine over the last 6+ years and 38,000 miles of not-babying it. Seats are red MOMO seats but had seen better days. Found a good deal to get them reupholstered. Red was too flashy so I went with black. I just received word that my turbo manifold is beyond fixing. Lost $10 getting the welds fixed, now I hear the flange is too warped/bent to fix. So yes I am looking for a new turbo manifold. 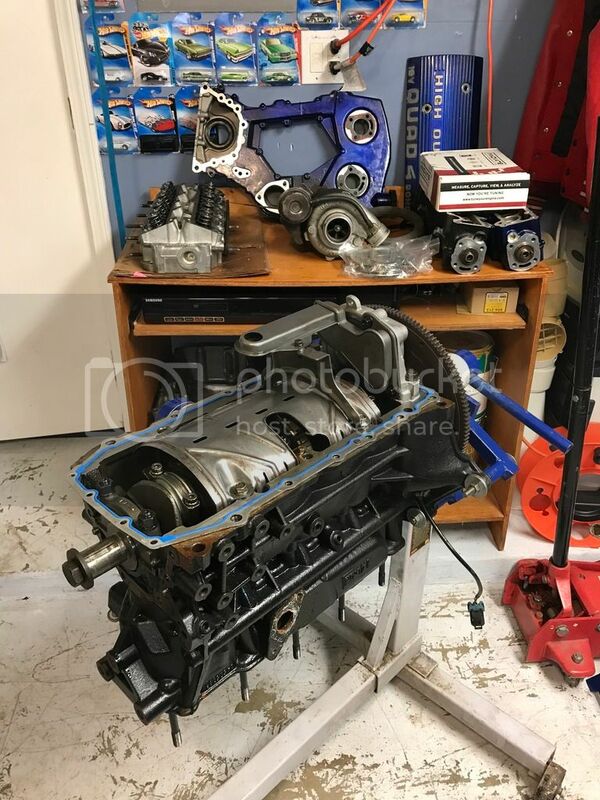 If I don't find a good deal I will risk it and go with the ebay manifold. I have since picked up a SRT4 so the Z24 is jealous when I pull up lol. I guess its just my luck as many others with that dam cometic head gasket. I didn't break her in either so that may have been it. I will post more pics soon on some updates. now I hear the flange is too warped/bent to fix. You can machine it flat. But it warped for a reason and will do it again. I had a poorly constructed manifold warp, I had it machined flat, it warped again and broke a couple bolt heads off, even. Mild steel on the flange (1/2" thick), stainless on the tubes and v-bands. That's what the guy who's currently making my all new manifold recommended, and he's made over a thousand turbo manifolds for all sorts of projects running bigger turbos and more power than me. No turbo manifold fabricators around you? It either works or it doesn't. There is no break-in. I have used GM, Fel-Pro, Cometic .051" and .074" in my extensive head gasket experience. The surfaces of the head and the block must be 50 RA or finer. ARP head studs, torque in 3 roughly equal steps to 85 ft-lb. Machine shop was able to machine it flat but the price was not acceptable. They gave it a shot for 10 minutes but said it would require more work. And at the price they gave me I said hell no. I do have a few options to build one but this project is on the low end of the budget. Don’t plan to go all out.....but I do have Eagle rods and Weisco pistons in there so it would be nice to push it’s limits. What’s the max psi with a Felpro head gasket? I looked up my old thread on Aleromod. "After 5,000 miles of moderate boost (10 psi), the gasket leaked coolant into cylinder one severely after some tuning runs @ 14 psi from the Garrett T3 50 trim .48/.42 turbocharger" (small Volvo OEM one). Multiple others from JBO mentioned theirs also failed at similar levels of use, and the recommendation was to use Cometic at 85 ft-lb. I used a GM gasket at 75 ft-lb, but apparently only torqued the smaller studs by cyl 1 to 40 ft-lb, and had a leak there 10,000 miles in once I started using the GT3076R and 18 psi. 4th time's the charm, using the thick Cometic and no issues no matter the abuse. I mean head gasket problems are pretty definitive. You either have coolant in the cylinders/oil or not. In my experience the coolant tank gets all bubbly and noisy, you have tons of white smoke, and/or there's coolant puddling on the top of a piston or two. Always had coolant on the pistons when I thought there was an issue. Right now my car stumbles at cold startup briefly and it scares me because that's exactly what it did when coolant was burning off, but there is absolutely zero coolant in my system, and I'm 99.9% certain my fuel injectors just stick slightly open and leak overnight or after being parked for a long time allowing fuel to sit and have to be burned off at first on cold starts. If it sits long enough there is no stumble, so the fuel probably evaporates by then. Makes sense to me and I'm sticking with it until something happens otherwise. My car runs great with no cooling problems.